Cantinflas Super Comic Super Star Super Man. Mario Mareno Reyes was the sixth son of 15 children, who became a world-wide cinema super star, was married to the same woman for over 30 years, and made enormous financial contributions to the Mexican poor. You may not think you know of him, but you do. He was known as Cantinflas. There are two stories about how he chose that name. One story is that his family regarded show business as less than respectable, and so he changed his name in order to avoid bringing shame upon them. The other is that, at one of his first nightclub engagements, a heckler taunted him with, "En la cantina, tu inflas!" ("In the bar room, you drink!"). For some reason, this taunt amused him, and he shortened it into Cantinflas. 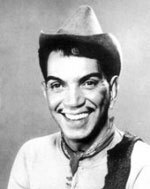 Cantinflas began his career when he was 16 years old, as a song-and-dance man in "carpas," variety shows performed in tents. He appeared in Vera Cruz, Jalapa, and Mexico. He was also a circus clown, and a bullfighting clown whose job it was to divert the bull's attention from a fallen matador, as well as an amateur bullfighter. In addition, he found work as a singer, boxer, shoeshine boy, and ticket taker, all of which experience he would use in film roles. His early films include "No Te Enganes Corazon/Don't Deceive Yourself, My Heart" (1936) and "El Signo de la Muerte/Sign of Death" (1939), but it was "Ahi Esta el Detalle/There Is the Detail" (1940), which began his reign as the Spanish-speaking world's most popular comic. Usually sporting double daubs of mustache juxtaposed with the outer edges of his upper lip like a pair of hairy apostrophes, his dark and curly mane was tousled, and he sometimes sported a hat perched at an impish angle. Cantinflas essentially played the "pelado", an impoverished, bumbling simpleton, who found himself fighting the rest of the world in order to achieve justice. His characters defended the weak, touched our hearts, and had a problem keeping their pants up. Charlie Chaplin himself, upon seeing the work of his younger Mexican colleague, called him "the greatest comedian in the world." One of Cantinflas' trademarks was his rapid talk as he outsmarted authorities with a lengthy stream of chatter that sounded like gibberish. He was Inspector Clouseau long before Peter Sellers. In his honor, the Spanish Academy created a verb, cantinflear, the meaning of which is to talk rapidly, yet what you're saying doesn't make any sense. Two dramatic films of Vincent Blasco Ibanez' 1913 definitive bullfighting novel, "Blood and Sand," had already hit the American silver screen -- the Rudolph Valentino-Nita Naldi version in 1922 and the Tyrone Power-Rita Hayworth version in 1941, and Cantinflas simply was unable to resist making his own satirical interpretation, which became the personal favorite of all his 50 films. "Ni Sagre Ni Arena/Neither Blood nor Sand" (1941), was a riotous, hilarious spoof of both the Tyrone Power and Rudolph Valentino versions. Cantinflas was every Saturday Night Live regular, The Three Stooges, and all seven dwarves squeezed into one little Mexican man, whose energy level surpassed the octane level in PemEx. By the mid-50s his fame from films including "Un Dia con el Diablo/A Day with the Devil" (1945) and "El Bombero Atomico/The Atom Bomb" (1951) had spread over the world. It got the attention of Hollywood producer, Mike Todd. Todd cast Cantinflas in the pivotal role of Passepartout, bicycle-riding, resourceful, comic valet to David Niven's rigidly snobby character, Phineas Fogg, in the lavish production of "Around the World in 80 Days" (1956). Cantinflas' performance ranked among the most memorable in this film, which was the very first to ever use cameo roles. Cameos included Red Skelton, Marlene Dietrich, Noel Coward, Shirley MacLaine, Jose Greco, Ronald Colman, Buster Keaton, Beatrice Lilly, and Frank Sinatra, among others of equal fame. Not to mention that it was narrated by Edward R. Murrow. For his portrayal of Passepartout, Cantinflas was awarded the coveted Golden Globe by the Hollywood Foreign Press Association. Cantinflas followed this triumph with another lavish, cameo-ridden vehicle, "Pepe" (1960), which was neither a financial nor a commercial success. Although he made various U.S. television appearances ("Ed Sullivan Show," mystery guest on "What's My Line? "), he never made another U.S. film. Instead, Cantinflas returned home to Mexico, continuing his collaboration with director Miguel M. Delgado which had begun in 1942 with "El Gendarme Desconocido/The Unknown Policeman". In a 1972 series of cartoons, "The Adventures of Cantinflas", and in features like "Un Quijote Sin Mancha/A Quixote Without a La Mancha" (1969) and "El Ministro y Yo/The Minister and Me" (1976) the gracefully aging comic still delighted his immense following. Cantinflas spent much of the 1980s involved in philanthropic work, especially for the benefit of children, and he was honored with a lifetime achievement award by the Mexican Academy of Cinemagraphic Arts and Sciences in 1988. Cantinflas, who died a multi-millionaire at the age of 83, never forgot where he came from. Much of his money was given over to charitable work, including high-quality, low-income housing for Mexico City's poor. He was hailed as a national hero, and a lengthy period of official mourning followed. His adopted son, Mario Arturo Moreno Ivanova, a graduate of Betty Ford Clinic, was once wed to a former Miss Guanajuato, who wrote a tell-all book about their marriage. After his father's death, Moreno Ivanova became involved in a twelve-year, multiple-party struggle over the rights to the Cantinflas films. "Around the World in 80 Days" (1956).